Dealing with acne rosacea is a whole different ball game than treating acne like blackheads or whiteheads. The thing about acne rosacea is that hardly any acne treatments are tailored to address redness. Clinique offers a Redness Solutions treatment line that claims to help address reactive redness or persistent redness. Will Clinique Redness Solutions really we able to smooth and balance out irritated skin? This depends entirely on the ingredients. The Redness Solutions line should relieve blotchiness, soothe discomfort, and reduce redness. Better skin should be seen in about two weeks, but what kind of products is Clinique offering?The variety of Redness Solutions includes an Urgent Relief Cream. The Urgent Relief Cream soothes upset skin and should calm flare-ups almost instantly. Urgent Relief Cream happens to contain 0.5% hydrocortisone. Hydrocortisone is considered an over-the-counter steroid and as it turns out this ingredient can actually cause rosacea itself.The Urgent Relief Cream is more for reactive redness. 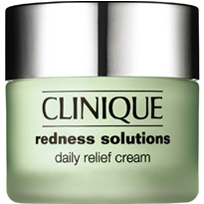 Redness Solutions offers a Daily Relief Cream for persistent redness. Daily Relief Cream soothes the skin from itchiness or irritation using green tea extract and shea butter alongside numerous other ingredients.Another Redness Solutions is the Daily Protective Base SPF 15. This protective base can be used every morning as a primer under makeup to protect the skin from UVA/UVB exposure that aggravates rosacea. The treatment even has a green tint to counteract the appearance of redness. The last Redness Solutions treatment is the Soothing Cleanser. The cleanser removes impurities from the skin, preserves moisture on the skin, and can be used a mild exfoliator.To go through every ingredient in each treatment is a waste of time. A lot of these treatments contain several of the same ingredients as moisturizers or fillers. The bottom line with Clinique Redness Solutions is that a lot of people who suffer from rosacea have expressed disappointment in the products. Numerous people receive mediocre results and the reputation the product line is getting isn’t very good.